An image of an unreleased graphics card PCB has appeared online claiming to be that of an Nvidia GTX 1180. The PCB features connections for eight memory modules, a moderate GPU die, 10 phase VRM, dual fan headers, and 6+8 pin power connectors. It also comes with an NVLink connector. Odd. The image shows both sides of a potentially finalised reference PCB, although whether or not this is the fabled GTX 1180 is still very much up for debate. The memory config will allow for either 8gb or 16gb chips in each slot, for a total of either 8GBs or 16GBs of, what we can only assume to be, GDDR6 memory. The current GTX 1080 features 8GB of GDDR5X memory. While we’d love to see the flagship card come in with 16GB of GDDR6, that could also be ludicrously expensive. 8GB of speedier GDDR6 memory would still offer greater bandwidth at lesser voltages, and it seems a little strange for Nvidia to bump the memory so significantly without all that much impetus from consumers, devs, the competition, or anyone other than enthusiasts. 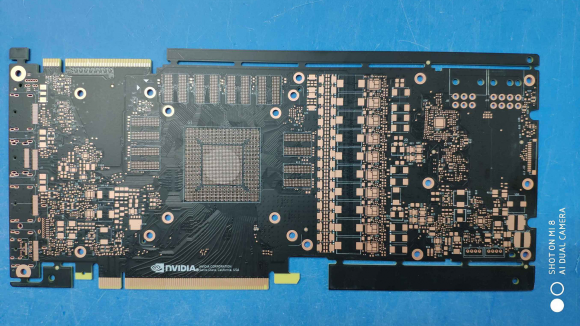 As for the power delivery, the leaked PCB image from Baidu (via VideoCardz) depicts some seriously chunky VRM components for a reference Nvidia GeForce design. This leaked GTX 1180 PCB has enough room for 10 whole phases worth of power componentry, potentially 8+2 phase, powered by 8+6 pin connectors. That’s more than even the GTX 1080 Ti, which was built on the same PCB as the Titan Xp. There’s also the NVLink connector – or what looks almost identical to one anyways. These connectors are used on Nvidia’s really expensive GPUs to increase bandwidth beyond what’s available to system over PCIe. 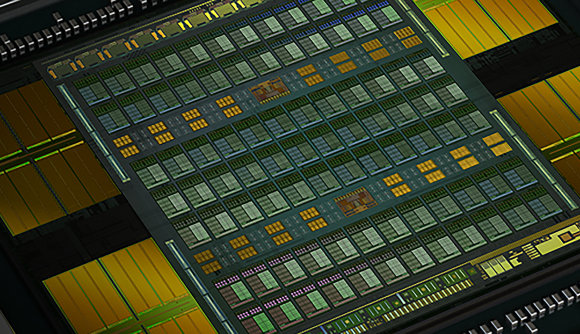 It’s also the basis for the NVSwitch connect that powers the gigantic 16-GPU DGX-2 AI system Nvidia rolled out earlier this year. Nvidia’s current multi-GPU interface, SLI, which is quite a bit less bandwidth-heavy than NVLink, hasn’t proven all that popular with the Pascal generation. Developers just aren’t all that fussed on the idea it seems. As such, it seems doubly odd that Nvidia would put an even more expensive interface on a GeForce card for the few stalwart multi-GPU aficionados still left standing. So maybe this isn’t the next GeForce GTX 1180. The NVLink connector, the dual-fan headers (Nvidia reference designs usually only have one radial fan), the chunky power delivery on a reference PCB… it just seems a little too expensive for the likes of us gamers, looking quite a bit like what you might expect from a high-end workstation card. Not to say us gamers are cheap, but most of us are not spending thousands of dollars on single graphics cards either.